I cannot help but to cry while doing this tribute to honor our beloved father. and heart is grieving like a lamenting event of great catastrophe. instead Allah (God) decided to invite my father immediately. toward the state of success we are living now. and blissfully haven. Farewell, for now. After coming back to Ankara last Friday (Jan. 27) in the afternoon, Uncle Robin (my father’s elder brother) sent me a message that my father was rushed to the hospital because his heart stops beating. I only got the chance to read his message on Saturday morning. The doctors from ER were able to revive him. However, his brain and internal organs were directly affected because of 20 minutes of no oxygen and unstable blood circulation. While he was quasi-unconscious on Saturday night, he was able to listen to all of the people who were there and talked to him including my mother and my sisters. Until, I was the last who talked through a mobile phone, and my mother told me that his tears fell and he finally bids goodbye. I will miss you, dad, wherever you are. In many years to come, we will be reunited when our time in this world had ended. 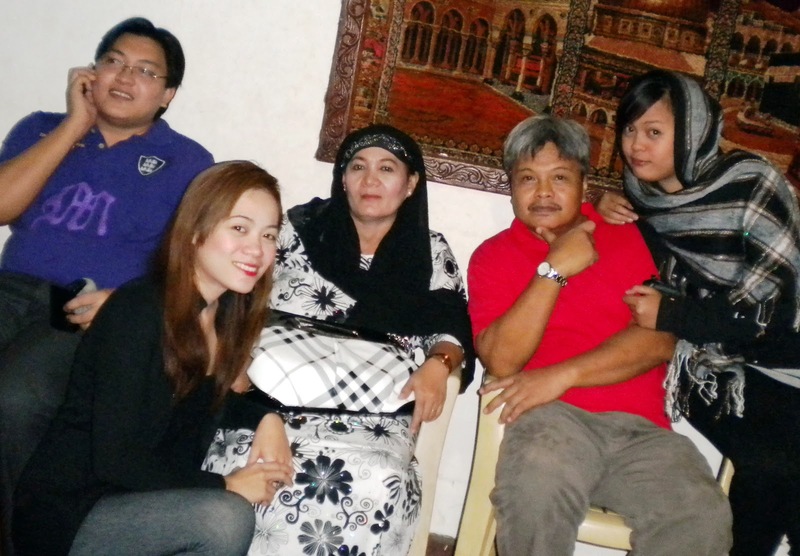 This was the last family photo taken in my grandfather’s home in Marawi City, Philippines. 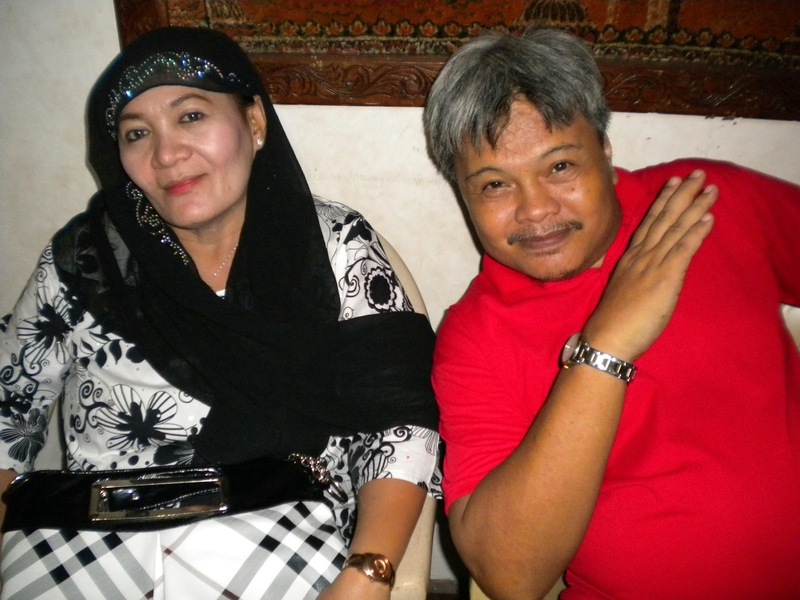 Evangeline Santos Nassef, am sure you remember me, though we had not communicated much…I was formerly one of the PTA Presidents of the former TCQC….your father is a very good friend a brother of mine, and just want to let you know that I personally grieved so much on your Dad’s passing. We share the grief on your loss…as it is also a great loss for us. All those who knew Naz and whose lives was touched by him…wanted to let your family accept condelences and prayers. We will truly miss your dad. God bless. I, together with my friends mourn the passing of a very good friend and Muslim brother…Naz Adiong. We pray for the early repose of his soul. May he bring with him happy memories of our comarederies..moments that made his passing painful for all of us. No doubt that your in the hands of our Lord now. Godspeed Naz…we love you!!! Your Dad Naz was very proud of you, in fact, 1st week of December, he told us you were coming from your successful doctorate studies from abroad, that they are just waiting for you, then we will have our reunion toether with your Mom Sandra. Regards to your Mom. I missed your Dad so much Nassef, he is one true brother….very simple, very kind, very loving, A TRUE SCOUT IN SPITRIT…everyone likes him…..there’s an empty space in my heart…regret that I hadn’t seen him before his passing in this world. You are one truly blessed child of Naz….you must really be so proud of him…..WE ALL DO!!! 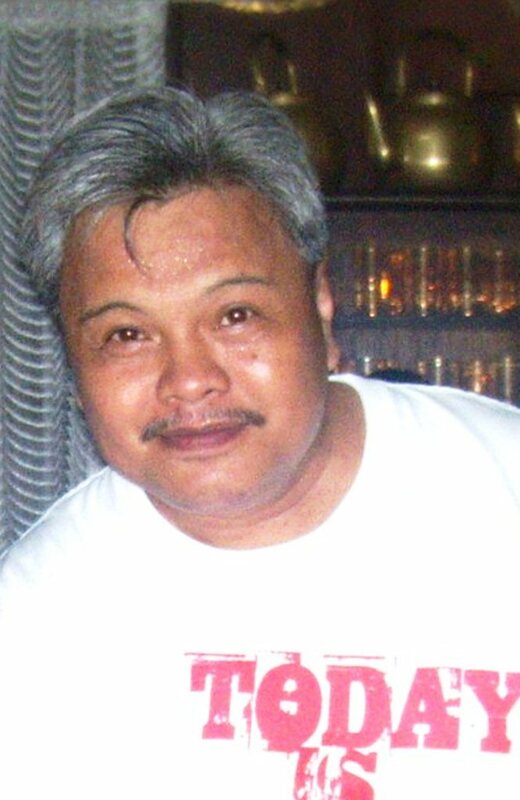 John Philip Santillan ‎Do accept my heartfull condolences to you and Adiong family. It was a shocking news, after a long years of waiting and just and two weeks ago, i was able to talk to your father through his cellphone, my bestfriend in highschool. May his soul rest in peace. . . . I still can remember his voice and our laughters, plans for summer. . . Nassef, thank you. And please do take care and give my regards to Robin he also knew me. May GOD bless you all. When someone you love becomes a memory, the memory becomes a treasure. Nassef, the fellowship and friendship we had with you father, i will never be forget and he will remain my bestfriend. I do miss him. Do take care and surely if you come for a visit norway don’t hesitate to contact me. Have a blessed day. Regards to the family and also to kuya Robin. Ibrahim Macatoon Abdulrahman Macacua I AM DEEPLY shocked and felt very sad upon knowing the untimely death of your beloved father NAZIR ADIONG, my best friend & my classmate (DC ‘73). I pray for his soul to rest in peace & for you to regain strength. Accept my heartfelt & deepest condolence! Dvine Gianan mare, i’m very saddened by what happened. Grabe nashock naman kme nila mama kanina. Hope your strength w0n’t fail you, sana nga andyan ako para mabigyan kita kahit unting c0mf0rt lang..wag k masyad0ng mad0wn lalo na nasa turkey k ulit isipin na lang natin peaceful n ang papa mo sa heaven..magkikita-kita din tau ulit! I love u mare, ingat ka dyan.. We send u our c0nd0lences.. I’m here sh0uld u need me..
Clemencius Munez nassef, my sincerest condolences. Be strong. We are always here for you. You have our prayers. Lorna Abarca hi nas! naiyak naman ako. i just read this. condolences to you and to your family. he just waited for you. am sure he’s just waiting for your voice before he let go. be strong nas and will pray for you. don’t worry nasa creator na natin sya. whatever you are feeling right now, it will take time to heal. ingat! nas, be strong dear! 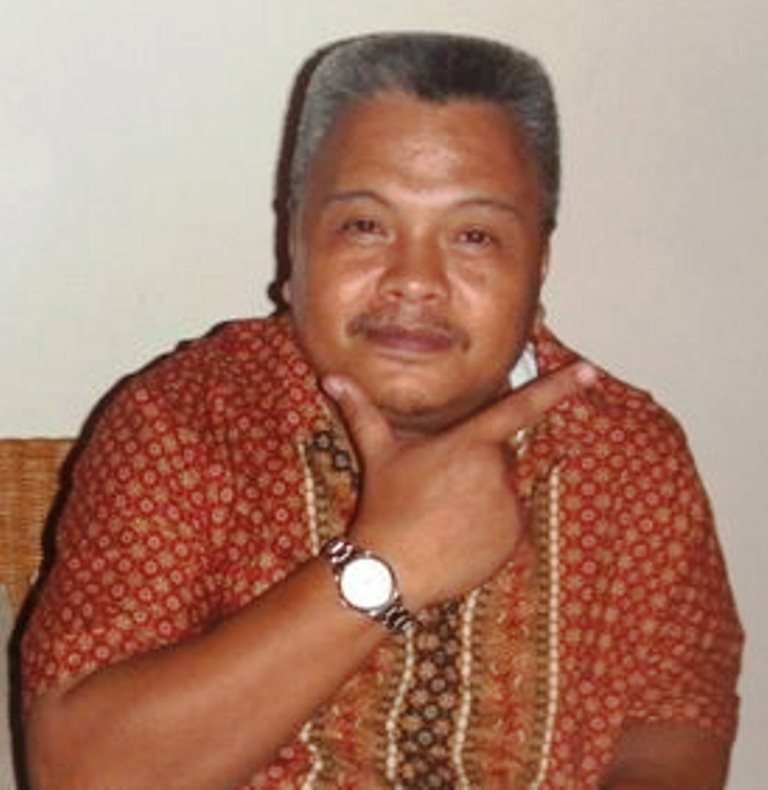 Alvin Go Dearest friend Nassef Manabilang Adiong, Please accept my heartfelt sympathy. I never expected that this will happened, since our last talked about him. : C Wherever tito may be, God will always be with him. I, with my family (im sure all your friends too), will pray for tito. He may not any more be physically present, but he will always be alive in the hearts of many people who loves him. Continue to shine, like the stars that shine in the darkest night. We will always be by your side. Dean Julkipli Wadi Dear Dr. Adiong; Our condolences to you and your family. Life is always like that for all of us. As it has a beginning, life has its end too. We all are from Him and to Him is our return. It was good you were able to talk to him; he passed away happy when he heard your voice. He must be very proud of you. In a sense, as he was an acccomplished man, he must have left you the torch to accomplish more not only for your family and relatives but in the service of higher ideals including the principles he believes in. Thank you also for keeping in touch and for sharing your success and moment of grief. I’d known too many friends and colleagues who I’ve seen their potentials and talents. You are one of them who stand out almost singularly. Good luck and our du’a to your late father and may Allah bless him. Best. Dean Meliha Altunisik Dear Nassef, I am so sorry to hear this news. I lost my mom a year ago. So I sincerely understand how you feel. This is a great loss. I console myself by cherishing the good memories we have had with my mom and believing that one day we will meet again. I advise you to do the same. May Allah rest his soul in peace and give you strength. My very best wishes. Prof. Dr. Yasin CeylanDear Nassef, I am exrtremely sorry for your father’s death. I can imagine how much you are affected by the event. You also know as a beleiving Muslim that he has returned to his Lord, Allah. The only thing that we can do for him is to ask God for mercy and forgiveness. Love. Marigen Amador Zaimoglu Nassef my dear,as i told you …be strong!! !this is part of our life just pray for him and i know he is in good hands now.My deepest sympathy and condolences to you and your family.Dont forget that Iam here to help and comfort you…ate jean..
Adeliza Dima-Adiong Condolence klasmet & cozn…Kagabi dumting labi daddy mu but ADIONG FAMILY still cant believe what happen 2 ur dad! young age, very active 2 d’ family, always nkasmile & ur dad s one of legacy of ADIONG. Tanya Meikshane Nassef, dear Naseef. I am very sorry about your Dad. I wish he rests in peace. Many hugs to you! Take care. Joselito Dalisay He’s in good hands where ever he is, just be strong my friend and continue the good works you have started and that would make him even more proud of you. Condolence, Nassef. Rona Jane Savedra Condolence. welcome back sa Ankara, tawagan mo ako para makapagkape naman tayo. Jennifer Paladcondolence nassef and to the whole famıly of adıong…. Kristhel Anne S. Kabigting condolence nassef. btw my parents would like to know kung dito ba sa manila ung wake? kasma kasi nila yan sa PTA before di ba. Felix Oko Ankrahmy condolence nassef the Lord knows best. Boggs Tanggol Inna lillahi wa inna ilaihi rajiun. Monica Dulos Kuya Nassef, my condolences. Suray San Innalilahi wa inna illaihi rojiun…..my deepest condolence ..my dear friend Nassef. My prayer for him. Mj A Sagle condolence nassef…. 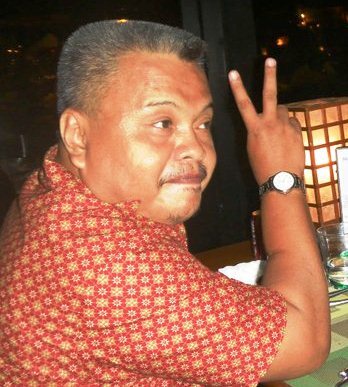 Marco Angelo Eugenio My most sincere condolences. Jobir MuminovInnalilahi wa inna illaihi rojiun \*_*/… Accept my deep condolences Nassef… May Allah bless you! Jona Sh I am sorry sweety…Unfortunately, there is a time for everyone to leave this world… It’s hard to accept this, but try to be as strong as possible and give a meaning to your life as I believe your dad did as well. Zy-za Nadine Suzara I’m sorry to hear this, Nassef. My condolences. Leyla Yosef Condolencemy friend im sure he will wait you in heaven.God bless him. Danny Swibel Sorry to hear bro..be well and remember all the good stuff! Sheila Dinn Yu-Aquende Condolence Nassef. Vivien Santillan Simms my condolenced to your family.your father was such good friend to us. Rosalie Stacey May the comfort of God help you during this difficult time…thoughts and prayers are with you. Ima…my sincere condolences on the loss of your Dad. Jhe Velasco miss u chacha.. 😦 condolence..
Edsen Contreras Bunag ate imz condolence..
Iyrah Francesca Lindres Imz imz….miz u n dn….condolence po…. Jasmin Rad I’m sorry Ima. Also my conodlence.Be Strong!! Gaze Isien Ngyn k kng nlman toh ah 😦 condolence mahal. Joyce Christine Sagle Galitcondolences dear..
Rhein ThoMas condolence ate imz. Curt Bryan Lacuata Condolence ate..
Aiza Llegue Dejucoscondolence alimah,, i met ur dad during our HS days,, and i still remember him til now.. im praying for ur family,, take care.. and IMY gurl..
Laurice Ann Sanz my condolence yma..
Amie Franssen-Halligcondolence Imah.. take care always..
Nassef,our heartfelt condolences to you and your family.I am Lilian Go a PTA officer at Trinity College together with Evangeline Santos.WE were all shocked upon learning of your Dad's sudden demise.Actually,last week of december 2011,I saw your mom and dad at SM centerpoint.We had a short chat and your dad even mentioned to me that you are arriving from Egypt? 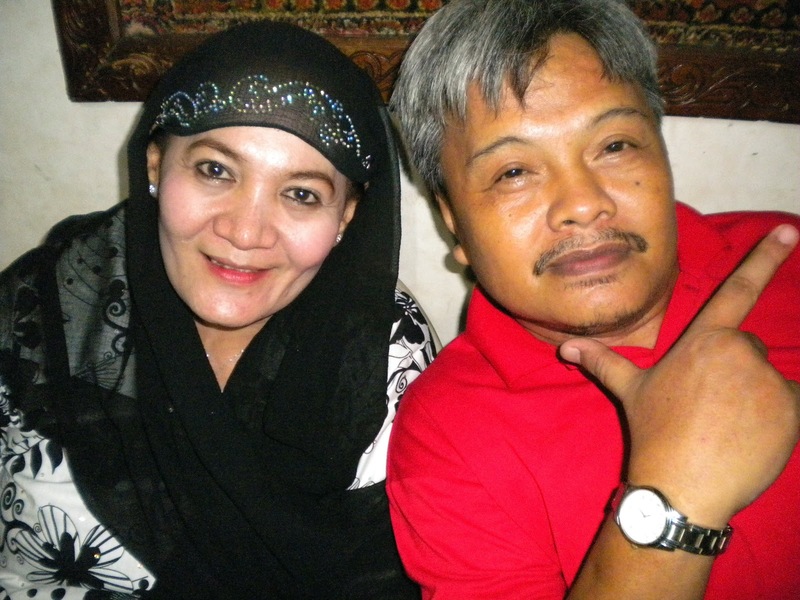 Anyway,your dad even suggested for us to have a reunion with our fellow PTA to be held at my place.He told me that you will all go to Marawi after you arrive in manila but, suggested that we first have the reunion.he asked for my cel no.so we could set the date.Your mom was with him at that time.I already informed Mrs Santos about it and also Mr.& Mrs. Rubis about the said reunion and told them to wait for further notice because Naz will call me up.We were all waiting for his call only to find out that he's gone already.We will truly miss your dad who's been a good friend and a true brother to all of us.pls extend my condolences to Sandra.